I couldn’t resist picking up and reading Stiff. The author is someone I’ve come to know through Reader’s Digest, her little articles about daily life making me laugh out loud and nod my head in understanding. With all the suspense/thriller and mystery books I read, gory fictional death scenes and dead bodies don’t give me much pause anymore [Ha! Not so true anymore, says my 2014 self]. So with a bit of morbid curiosity mixed in with wanting to read more by journalist Mary Roach and the high praise I had heard in regards to this book, I took a chance. It was well worth it. Mary Roach is a layperson who takes on a difficult and not often thought of subject. Her humor throughout is tasteful and respectful. I do wonder what the scientists and professionals thought and said after her visits though! I especially was interested in the historical bits she included in the book, often reading passages to my husband and coworkers much to their chagrin. I found myself shaking my head in wonderment at some of the experiments or ideas tested, laughing at the absurdity of some, and cringing at others. There were also moments when I had no doubt of the good accomplished by some of the trials cadavers are put through. Stiff has given me much to think about in regards to the life of my body after death. I never realized just how many uses there are for a cadaver. I first heard about this book in a newsletter and the subject matter intrigued me. I have always been interested in dreams, including the how and why. While some of the research covered in this book was a review from my undergraduate days, I found this book fascinating just the same. 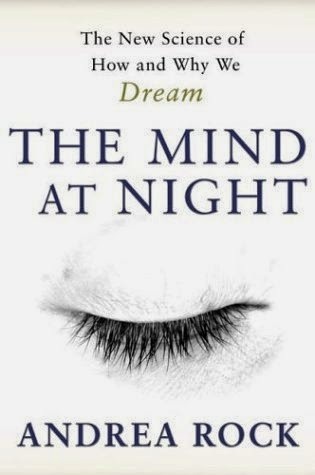 The Mind at Night focuses on the science of dreaming, much more so than analysis or interpretation of dreams, although there is some mention of that as well. The current theories regarding dreaming tend to evolve around the significance of dreams during memory and learning processes. The emotional significance demonstrated in dreams was discussed at length, including how they impact individuals during their waking hours. Also, the current advances and theories in the uncovering of consciousness were touched upon. I came away from this book with more admiration for the brain and it’s complexities than ever before. The brain is an amazing organ. I look forward to seeing what further research reveals in this area down the road. The Mind at Night was well written and interesting over all. Both of these sound excellent. I'm definitely adding Stiff to my list, and I'm always interested in the neuroscience of dreaming! Lately, I've seen several articles in The Guardian about dream studies, so fascinating. Thanks, Wendy! Dreams fascinate me and I find the science of them especially so. I imagine the book is a bit dated, being ten years old, but I imagine much of the information would still be relevant. I'll have to look up the articles you mention in The Guardian. Stiff has been on my to-read list ever since I started blogging. I seem to have forgotten about it lately. I've thought that it does sound a little too morbid, but I'm sure it will be a fascinating read. I really enjoyed Stiff as well and look forward to reading some of her other words. Like you mentioned, the history bits were fascinating...but I wish I could forget how she described the sound of maggots feeding. *shudders* Have you read any of her other (longer) works? Trish - I've read Spook by Mary Roach, which I enjoyed--although not as much as Stiff. I tried listening to the audio version of Bonk but didn't feel the narrator was a good fit for the book--or for me. I want to try it again in print form at some point. I read Stiff when I was in college "for fun," as much as reading about dead bodies can be fun. LOL! I really liked it, and little did I know then how my future work would actually make it kind of more relevant. I definitely have to pick up some of Mary Roach's other work sometime. She definitely did a great job of making an obscure and kind of taboo topic interesting and accessible. Megan - Stiff is such a fascinating book, isn't it? And I love that the author is a layperson like us. That's cool that your work makes a book like Stiff more relevant to your life. I have Stiff. My husband read it and enjoyed it and I've been meaning to pick it up for years. Glad you enjoyed it! The book about dreaming sounds interesting too. Katherine - I can't recommend Stiff enough. :-) It may be a morbid topic, but it really is a fun book. I want to read Stiff but the subject matter makes me so nervous. I have read such good reviews for it though. I will read it eventually :) Great reviews! I would not say these little reviews have "little substance" at all! Sometimes the brief ones are better, it's easier to pay attention to them when so much other information is coming at you all day long. I too go through my old logs of books and occasionally post about ones I read long before I began blogging. Someday I'd like to have a record of all the books I've ever read, just to make it feel complete, but that will take me a very long time to catch up all my thoughts! 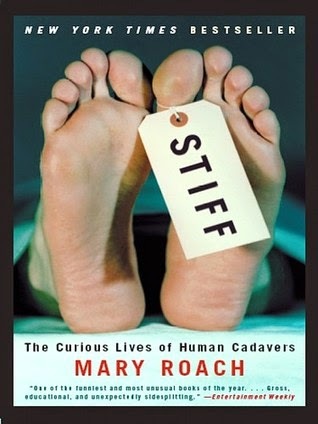 I do want to read Stiff, and all the other Mary Roach books- never opened one yet and they all sound so fascinating. Jeane - That is so nice of you to say! Thank you. I wish I had begun keeping a reading journal of all I've read sooner than I did. So many lost thoughts on books I've read . . . Of course, if i don't remember, I suppose that says something in and of itself, doesn't it? I enjoy Mary Roach's approach to topics that interest in her and the humor she adds into it. She makes learning fun. These sound like an excellent read, Wendy! I rarely read nonfiction but I think these books make an intriguing read alongside with the info. Thanks for the wonderful reviews, Wendy! Melody - I don't often read nonfiction either, Melody, but I wish I did. I always enjoy the nonfiction I do read. These both sound equally fascinating to me. I am adding them to my list. Irene - I hope you do consider reading them! Especially Stiff. Mary Roach is on my TBR list. I have Gulp on my shelves figuring I was too chicken to read Stiff...lol. Thanks for sharing your past reviews! I've read several of Roach's books, and I think Stiff was probably my favorite so far. Just bizarre stuff! Her books are the kind that make you want to quote everything to your friends or husband. It's been years since I read Stiff but it is still one of my favorite books. I did not like Spook as well. Have not read any of her other works. I remember reading about the body farm and remembering an episode on CSI tv show that featured something similar. I remember reading about Burke, and then I watched the movie Burke and Hare. And anytime I watch a cop show now, and they mention "burking" I know what they mean! It was just a book that really stuck with me. It had so much interesting info in it. I think it would be cool to listen to the audio version. Carla - After reading Roach's book I became obsessed with knowing more about the body farm and began reading everything I could get my hands on about it. I found it so interesting! Both of these books look very interesting! Like you, my 2014 self isn't as nonchalant about fictional death scenes as my 2005 self was (having kids has made me such a softie!). I need to read Stiff. I know it's been on my wish list forever!